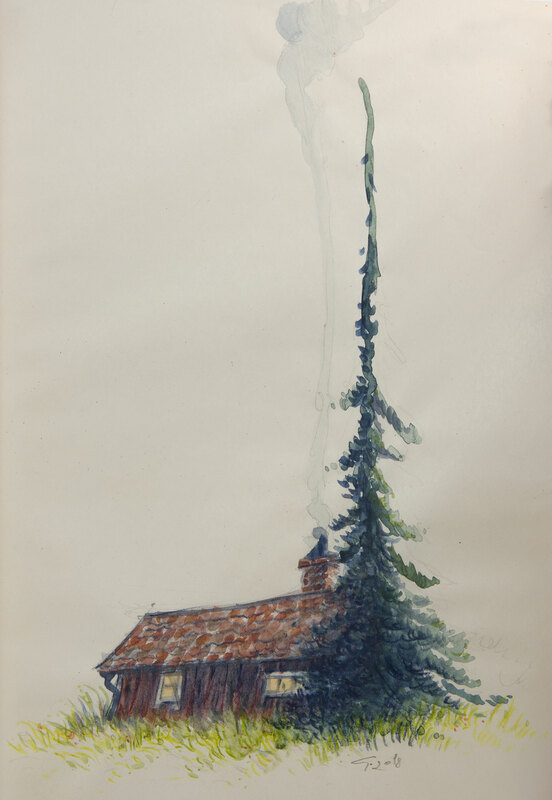 When I was in my teens I used to do aquarelles of the very typical houses of the Stockholm archipelago. 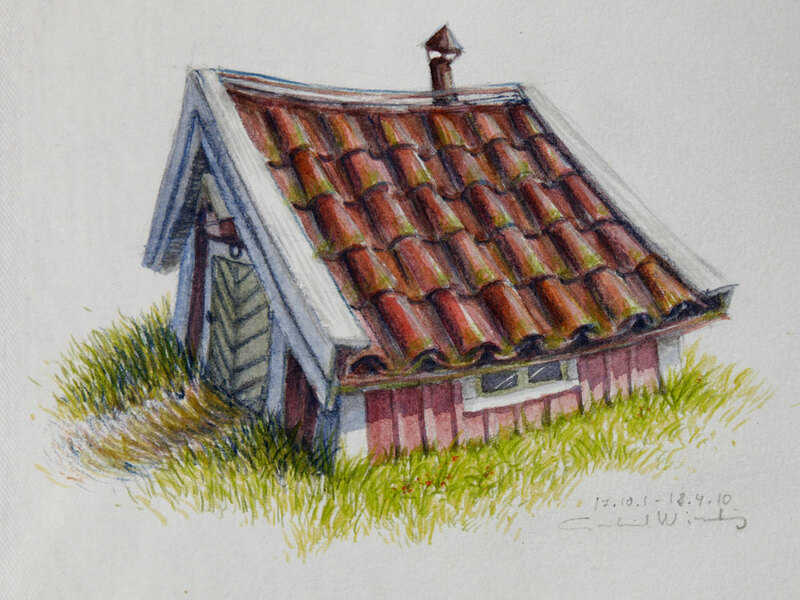 They were not depictions of actual houses but rather my fantasies of ideal ones. And they were more than houses, they were living things, perhaps growing out of the dirt like mushrooms. These thoughts have come back to me, here’s a recent one. 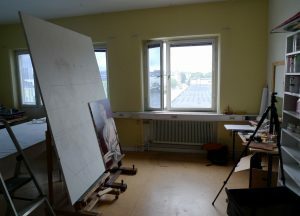 I’m proud to announce my participation in the new fine art supplies web shop Färg.se. The company has been around since 1989, but this is a complete refurbishing of their art materials supplier brand. It’s been work day and night for the past few months, and tonight we went public. This is one expression of my passion for art materials. It’s also a way for me to remedy the stalemate that has had a grip of the Swedish art supplies business all since well before I was born. 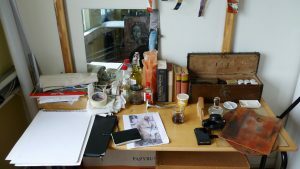 There has been a dead post-modern silence around materials, their possibilities, how certain effects are achieved, what does not work and how to make things last. Ironically enough, in one sense post-modernism was about not letting rules, materials or opinions hinder the artist’s expression. Now that expression is eroding away in the hands of desperate conservators. I’m in no way trying to diminish any conceptual, aesthetic or philosophical conquests of this era, but I question those who bow before this dogmatic non-dogma. Handling quality materials is similar to cooking. A passionate chef would never dream of taunting quality groceries or sharp knives, nor would a musician belittle fine instruments. 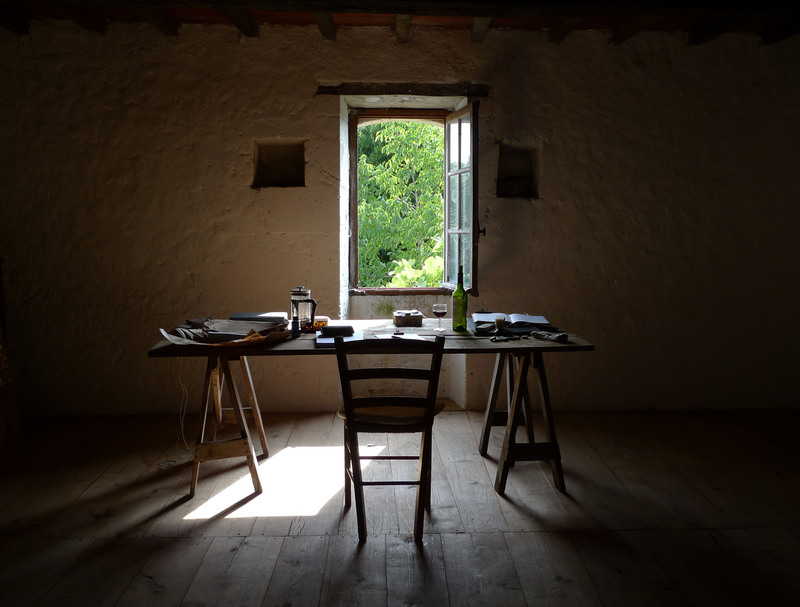 But among artists it has for decades been considered unartistic, unfree, to have an interest in one’s tools. The real effect of this has not been generations of genius creativity, but rather ignorance about longevity and blind conformity to advertisements of the material conglomerates. Yes they are conglomerates. The art material industry is one of the oldest in the world and today most traditional brands have been acquired by financial groups. I actually finished this years ago. The figure is an unfinished underpainting with the plan to do an experiment in Caravaggio chiaroscuro. But the grisaille against the rose madder lake background made me hesitate, I liked it too much. I had longed to make a chiaroscuro portrait so I was hesitant wether to continue or not. Other work came in the way and the decision was postponed. One day an artist friend came by. She reacted with amazement. I trust her artistic intuition, so when telling her my plans, she said: No, it’s finished! You must see that! She has guided me before in aesthetic dilemmas. 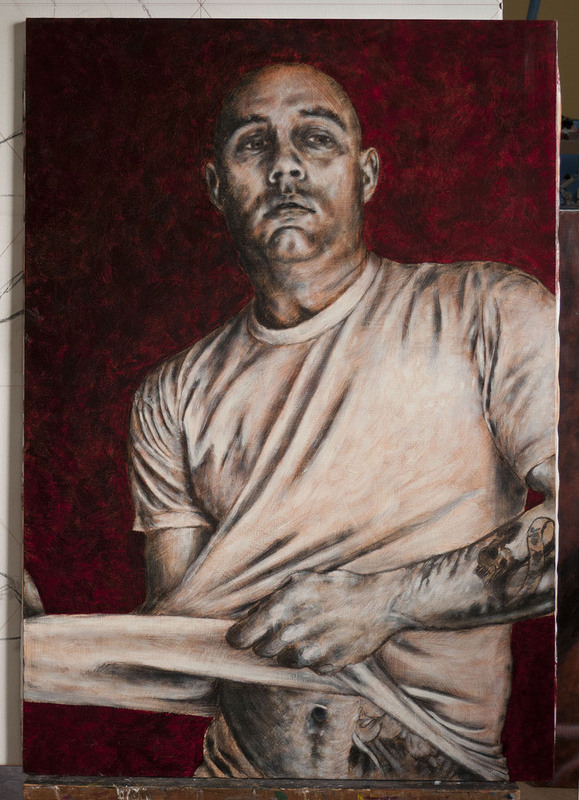 I now do consider the painting finished, and I can—tail between legs—finally varnish it and deliver it to my brother. 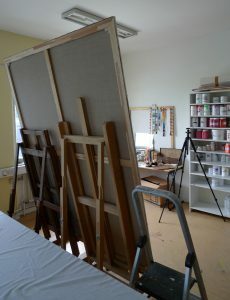 For logistic reasons I had to temporarily settle for an atelier in Västberga. Much gratitude to Screentec AB, a provider of high quality screen printing paint and equipment. High ceilings, rough enough for not having to care, daylight from west (and south). The room makes me efficient. Things are falling in place. Always a good exercise to move your tools in the sense of getting to know what is really necessary for work. Decades of living, feeling, longing and thinking. Images from a child’s world reforged to withstand the scrutiny of adult boredom. Three years of writing and three years of rewriting. Then today it was good enough to be let go of. 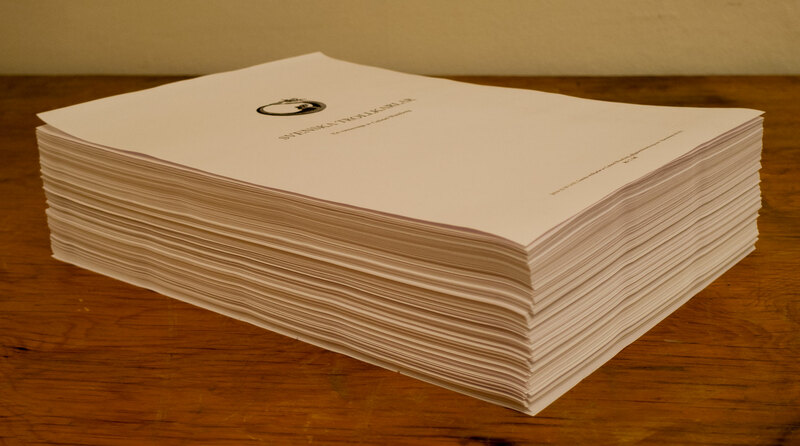 I’m referring to my novel that is being sent off to two dozen publishers and literary agents. 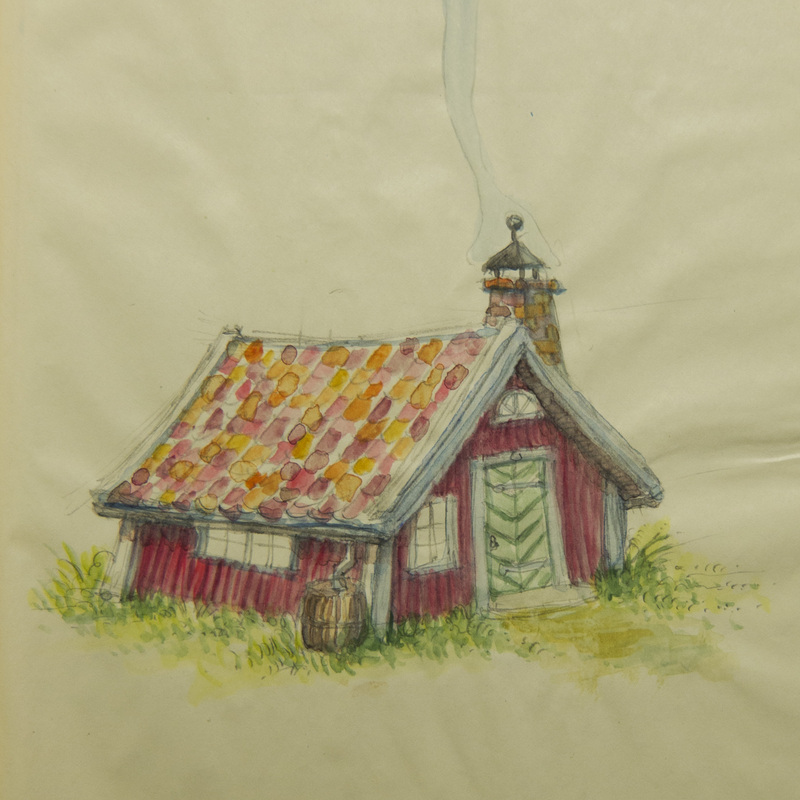 The story takes place in a 20th century vision of the Stockholm archipelago with its thirty thousand islands. It’s a witnessed tale, set in the borderland between saga and reality, about the young Ivan’s confrontation with childhood dreams and horrors. Adventure, auto-fiction, Socratic dialogue and mythic realism. I wish you luck, dear book! 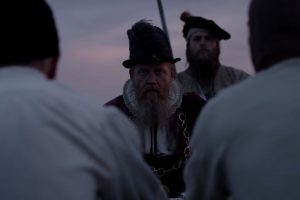 During the summer and fall of 2014 I was commissioned as historic consultant for the shooting of a documentary about the Swedish warship Mars Makalös that sank in 1564. The powder house caught fire and exploded during the heated battle between. There were Swedes on one side – led by Admiral Jakob Bagge under King Erik XIV – and on the other Danish as well as Hanseatic forces from Lübeck. Mars rapidly sank and took with her up to 800 Swedish and German soldiers to a depth of 75 meters. It was just outside the northern coast of Öland in the Baltic Sea. 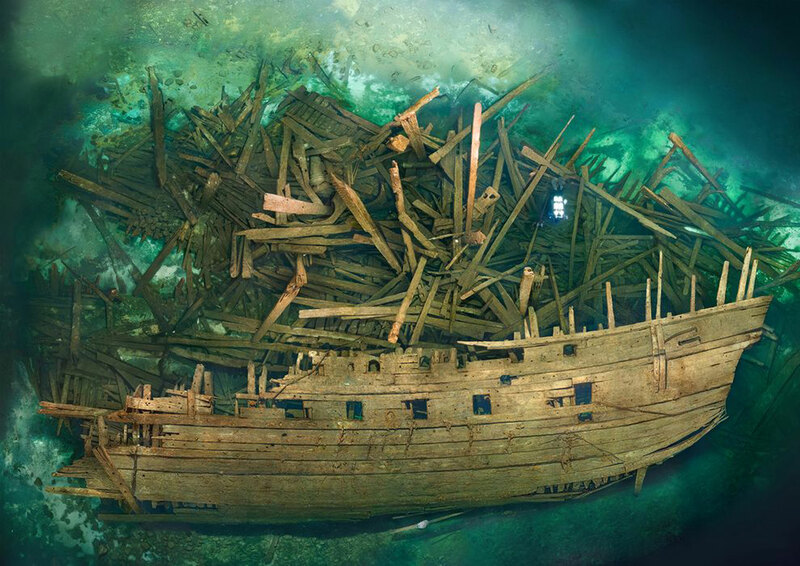 In 2011 the wreck was discovered by Richard Lundgren, his brother Ingemar and their colleague Fredrik Skogh. Being professional divers and wreck hunters this was the peak of a 20-year search. They soon decided on a documentary about the ship and her history. But it wasn’t only to be a story about life at sea during the 1560’s, but also the great adventure of finding her. 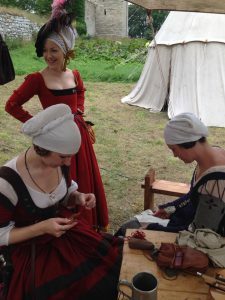 I was contacted to be part of the production team to oversee historic correctness for the dramatized scenes, in terms of scenography and costume and as far as budget allowed. 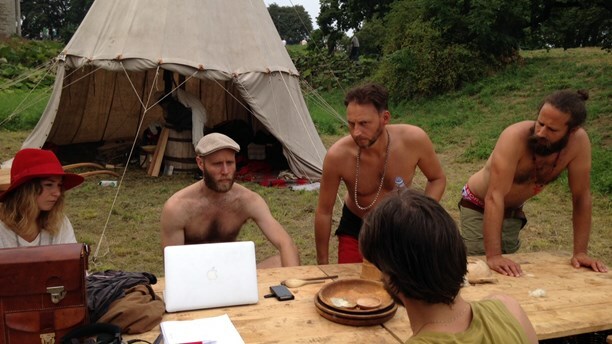 Here is an interview by Swedish Radio that visited us during the shooting of a camp scene in Visby (in Swedish). The film was produced by Deep Sea Productions AB, financed by ZDF, German public service, and Swedish Television. It will be released for German and Swedish audiences at the earliest in the spring of 2015. Here is more on the project by National Geographic. Some of the camp ladies. 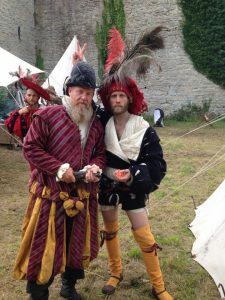 Admiral Jakob Bagge and I in the camp. 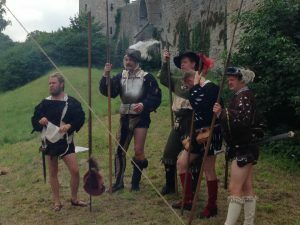 Some of the landsknecht soldiers just outside the city walls of Visby. 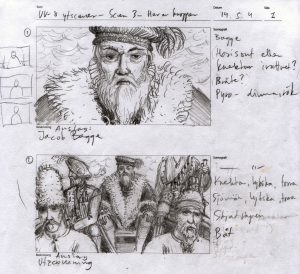 Storyboard and costume sketches. The Swedish Admiral Bagge was taken captive by Admiral Knebel of Lübeck. Actual shot with Admiral Bagge in captivity on their way to Stora Karlsö after having lost the battle. A “colorful abstract” was commissioned by a family for their son’s fortieth birthday. Based on an idea of visual interpretation I’d had some years earlier, and inspired by the full color schemes of the Futurist and Fauvist movements, I composed this lanscape with a road.